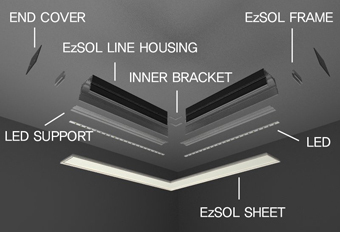 EzSOL LINE is developed recently with our independent technology. with stretch ceiling structure is designed. EzSOL LINE can take many difference forms and shapes with different mixes of angles. as EzSOL ceiling, and then you can do maintenance job with ease. purchase), LED supports and EzSOL sheet.